Dr Wendy Garden is the Gallery Curator at the Maroondah Art Gallery, Ringwood. From 2002 to 2010 she was the Art Collection Curator at Banyule City Council in Melbourne and prior to that Curator at the Royal Historical Society of Victoria. Her research and writing interests have focussed largely upon photographic portraiture in nineteenth century India and Australia, and the reinterpretation and reinvention of those works by contemporary artists. In 2010 she completed a PhD at the University of Melbourne entitled Troubling the Archive: Photomedia Interventions by Australian Contemporary Artists. She also holds a Masters of Arts from the University of Melbourne; her thesis topic was entitled Performing Identity in British India: A Perspective through the Camera Lens, 1850s-1900s. 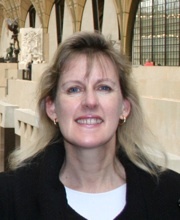 She has given numerous conference papers both in Australia and overseas and her publications include a forthcoming article entitled: 'Ethical Witnessing and the Portrait Photograph: Brook Andrew', Journal of Australian Studies, 2011. In 1992 Sydney artist r e a created a series of ten digital composite prints from early twentieth century portrait photographs of young girls employed in domestic service. Up until the mid-twentieth century many Aboriginal girls in New South Wales were forcibly removed from their families, institutionalized in government run training homes and sent out to work as maids for white families. Their portrait photographs were kept as records in the Aboriginal Welfare Board files and mobilized as visual propaganda to promote the success of government policies. This paper is driven by an enquiry into how the meaning of these photographs changes when the portrait is rematerialized and recontextualized into a digital print exhibited as an artwork. In the series Look Whose Calling the Kettle Black, 1992, r e a draws upon the photograph's indexical fidelity but through the medium of digital print technology, dissolves expectations of truth and mobilizes a more interrogative engagement with the portraits. I argue that by rematerializing gelatin-silver photographs into digital collage, comprising text and computer-drawn graphics, r e a foregrounds the ways in which young Aboriginal girls were dehumanised by assimilation policies and racist ideologies. As one of the first Australian artists to use new digital technologies, r e a's project was a pioneering endeavour that brought a critical spotlight to the past and installed an emotional tone to remembering the history of the Stolen Generations. At the same time her project highlights the regenerative role the archive can play by providing a repository for the safe-keeping of memories for later reclamation.